In the following scenes Max learns that they have new neighbors and then he sees Kevin for the first time. On the second replay I don’t stop or question or intervene at all. I just let the input, which is now comprehensible, soak in. It won’t all be acquired of course, but it’s a beginning. Then we hear Gram chatting about going to the market and the price of pot roast. She mentions there are new neighbors. I usually translate this myself for the students because it’s mostly low frequency vocabulary. When she says “Her name is Gwendolyn,” I ask if Gwendolyn is a girl or a boy. This is not obvious to most of my students, so I point out that “her name” means “son nom à elle”. I do this tiny pop-up to help them with the difference between His and Her which gives them a lot of trouble. If I have more advanced students, I might ask what we can understand when she says “She’d be just about your mother’s age.” I do NOT ask the trick question “Is it “She had” or “She would”. I tell them that it means “She would be just about your mother’s age” and I translate “Elle serait un peu près l’age de ta mère.” Then I ask what this tells us about the boy’s mother and help them to realize that the boy’s mother is probably dead. My intention is to help them grasp the meaningful difference between “She is” and “She would be”. Grammar is only relevant when it gives us information about the characters and their situation. Then we see the boy in his backyard and we see Kevin for the first time. The boy does what most people are tempted to do when they see a person who is handicapped. He stares. Gwen, played by Sharon Stone, appears and talks to her son. We learn immediately that Kevin is very intelligent. We see him fly his “ornithopter”, which his mother says is a big word for a mechanical bird. Kevin explains that he’s trying to take advantage of what looks like ideal flight conditions this evening. The subtitles shrink his statement, so I ask the students if they hear the missing words. We listen again and again, until they do hear that he’s saying more than is written on the screen and are proud when they can hear “this evening”. I use the “what’s missing” technique with students often. It gives them confidence and gets them to really listen to the audio rather than relying completely on the subtitles. Often they are the ones who point out that there are missing words. Then we go to the boy’s gym class. We meet his gym teacher and see that he is not above making fun of the boy in order to get a laugh from the other students. It’s rather sad to see that my students are never shocked by his behavior. We skim through the scene, until Blade says that Max threw the ball at Kevin. The students have no trouble understanding what is happening. I ask about Kevin’s feelings and we agree that he is angry. Then we see the boy on the weekend, helping Grim repair the house and going to LD Reading class. Again, we translate the subtitles to get the idea, but we don’t linger. We do learn the boy’s name when the teacher calls him Max. 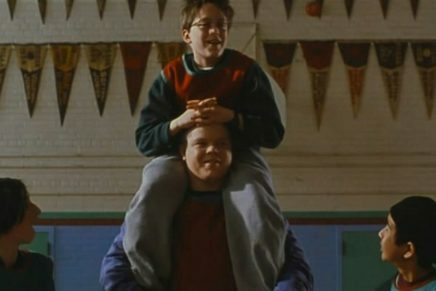 The scene between Max and his new tutor, who turns out to be Kevin, sets the tone for much of the film. I like to stop the film when on Kevin’s expression and ask, “What is he thinking? Is he remembering that Max threw a ball at him?” “Why is he so upset? Has he ever been in a special school ‘Where kids can’t even say their own names’?” Kevin is teaching Max to read, and since Max didn’t bring a book, Kevin uses his, King Arthur and his Knights. Kevin explains that “Every word is part of a picture, and every sentence is a picture.” I tell my students that this is true in English too. That when they read a sentence in English, they should be able to see a picture. We usually end with “Freak was patient. He told me that dinosaurs had brains the size of walnuts. And they ruled the earth for sixty million years.” And we can talk about the name of the chapter: Dinosaur brain. Finally I give them a summary of the beginning of the film. I use Comic sans MS to print the documents I give to students because it is said to be easier to read for dyslexic students. You may notice that in the readings I repeatedly contrast “tell” with “say”. My francophone students have problems with these words because they are both translated as dire. The summary is presented as an Embedded Reading, but I sometimes tell weaker students to read only the first version, or the first and second version. Of course, they usually return and let me know that they read all three versions. And I give them my “cat who got in the cream” smile. Max Kane lives with his grandparents, Gram and Grim. He is in the seventh grade but he is thirteen years old because he is not a good student. The Doghouse Boys are Blade’s gang. They make fun of Max because he looks like Godzilla. They sing “Killer Kane, Killer Kane, had a son who got no brain.” Blade wants to be friends with Max, because he could use his muscles. Max has no friends. Kevin Dillon lives next to Max. He is handicapped and he looks like a robot. His mother’s name is Gwen. Kevin is very intelligent. He built a mechanical bird. Max watched Kevin with his bird, but Kevin saw Max. He asked, “Have you never seen a robot before?” Max ran away. In gym class Blade threw a basketball at Kevin. He fell down. Blade told the teacher it was Max. He said, “It was Kane, sir.” The teacher told Max to help Kevin up. Kevin was angry and refused Max’s help. There is a boy named Max Kane. He lives with his grandparents that he calls Gram and Grim. He is in the seventh grade but he is thirteen years old because he failed the seventh grade. The Doghouse Boys are Blade’s gang. They make fun of Max because he doesn’t get good grades in school and he looks like Godzilla. They laugh and sing “Killer Kane, Killer Kane, had a son who got no brain.” Blade tells Max he wants to be friends with him, because he could use his muscles. Max doesn’t answer. Max doesn’t talk to anyone at school. Kevin Dillon is a new boy in the neighborhood. He lives next to Max. He is handicapped and he needs crutches to walk. He looks like a robot. His mother’s name is Gwen. She is proud of Kevin because he is very intelligent. He built a mechanical bird. Max watched Kevin with his bird, but Kevin saw Max. “What’s the matter?” he asked. “Have you never seen a robot before?” Max ran away. In gym class Blade saw Kevin and threw a basketball at him. Kevin fell down. The teacher asked who was responsible and Blade told the teacher it was Max. He said, “It was Kane, sir.” The teacher told Max to help Kevin up. Kevin was angry and refused Max’s help. There was a boy named Max Kane. He lived with his grandparents that he called Gram and Grim. Although he was thirteen years old, he was in the seventh grade because he had failed the seventh grade. Blade was a punk who had been in Juvenile Hall for three months. The Doghouse Boys were his gang. They made fun of Max because he was learning disabled and he looked like Godzilla. They laughed and sang “Killer Kane, Killer Kane, had a son who got no brain.” Blade told Max he wanted to be friends with him, because he could use his muscles. Max didn’t answer. Max didn’t talk to anyone at school because he didn’t have any friends. Kevin Dillon was a new boy in the neighborhood. He and his mother Gwen lived next to Max. He was handicapped and he needed crutches to walk. He looked like a robot. Gwen was proud of Kevin because he was very intelligent. He built a mechanical bird. Max watched Kevin fly his bird, but Kevin saw Max. “What’s the matter?” he asked. “Have you never seen a robot before?” Max ran away. In gym class Blade saw Kevin and threw a basketball at him. Kevin fell down and the Doghouse Boys laughed. The teacher asked who was responsible and Blade told the teacher it was Max. He said, “It was Kane, sir.” The teacher told Max to help Kevin up. Max said nothing and went to help Kevin get up, but Kevin was angry and refused Max’s help. On Saturdays Max went to Learning Disabled Reading Class. Kevin was his new tutor. Kevin told Max to close his eyes and listen to the story. He said, “Every sentence is a picture.” He told Max to read “King Arthur and his knights”. Max said he couldn’t. Max said he didn’t like to cause trouble. “So you’re a pacifist,” said Kevin.